In this discerning book, Monteagle Stearns, a former career diplomat and ambassador, argues that U.S. foreign policymakers do not need a new doctrine, as some commentators have suggested, but rather a new attitude toward international affairs and, most especially, new ways of learning from the Foreign Service. True, the word strangers in his title refers to foreigners. However, it also refers to American foreign policymakers and American diplomats, whose failure to "speak each other's language" deprives American foreign policy of realism and coherence. In a world where regions have become more important than blocs, and ethnic and transnational problems more important than superpower rivalries, American foreign policy must be better informed if it is to be more effective. The insights required will come not from summit meetings or television specials but from the firsthand observations of trained Foreign Service officers. Stearns has not written an apologia for the American Foreign Service, however. Indeed, his criticism of many of its weaknesses is biting. Ranging from a description of Benjamin Franklin's mission to France to an analysis of the Gulf War and its aftermath, he offers a balanced critique of how American diplomacy developed in reaction to European models and how it needs to be changed to satisfy the demands of the twenty-first century. 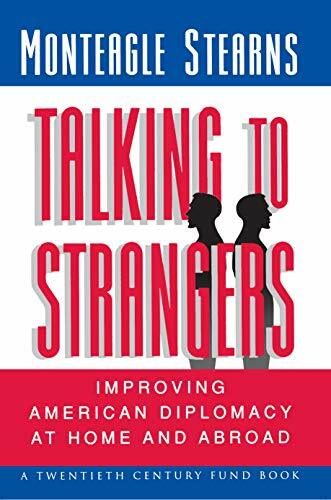 Full of examples drawn from Stearns's extensive experience, Talking to Strangers addresses the problems that arise not only from an overly politicized foreign policy process but also from excessive bureaucratization and lack of leadership in the Foreign Service itself. Anyone interested in our nation's future will benefit from reading Stearns's pull-no-punches analysis of why improving American diplomacy should be a matter of urgent concern to us all.